Orchha was founded as the capital of the Rajput state of Bundelkund in Central India by Rudra Pratap in 1531. The citadel is situated on an island in the Betwa river some sixteen kilometres from the nearby city of Jhansi. The Ramji Mandir, Raja Mahal and Jahangiri Mahal palaces, which date from the sixteenth and early seventeenth centuries, form the nucleus of the fort buildings. The surrounding land is dotted with further palaces, temples and formal gardens built by enthusiastic patrons. Orchha was invaded by imperial Mughal forces in 1634 who came to supress a rebellion. The Bundela dynasty remained loyal feudatories to Delhi for the remainder of the century. 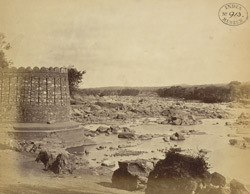 Following repeated raids by Jat agressors, the Bundela capital was finally moved to Tikamgarh in 1783.